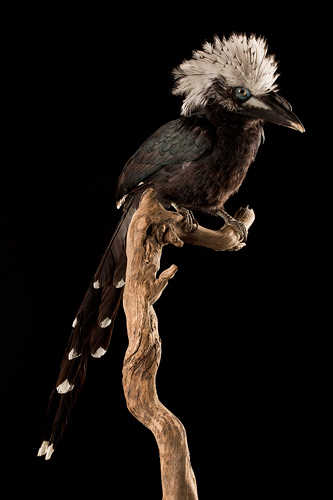 African White-crested Hornbill is the easiest to recognize in the 3 subspecies of all African hornbills. It is characterized by its beak without protrusion and a white tuft of feathers, the end ends with small black spots. The beak up to 7 cm is usually black with a variable pale spot at the base. The skin around the eye is bare and blue. These forest birds live in the galleries of the great equatorial forests until about 800 meters above sea level.They are fount in Guinea, Ghana, Nigeria, Angola, Uganda, Cameroon, Gabon and Congo. They live in pairs or family groups. Despite their very long tail, they climb with agility through the lower branches of trees and when they fly, they seem to float in the air with ease. They love fruits, insects, plant materials. The nest is made in a tree hole, which forms a wall of mud and feces leaving only a small opening through which the male can refuel as soon as the eggs have hatched. During its imprisonment, it loses all their feathers which it uses for the litter of the nest. Laying can include up to 6 eggs whose incubation lasts about 25 days. The female remains with them at the bottom of the cavity. Later, it leaves the nest to help the male to feed the family.